Most websites are written using PHP language. It allows creating the required functionality of the resource. PHP is well-suited for business-card websites, online stores, and for high-load websites of news agencies or social media. Later, however, sites in pure PHP can be loading slower. The common reason for this is that the design of pages contains a great number of images. Browsers have to upload the images, which slows down the display of the site. The OptiPic plugin provides image compression on the PHP sites. It works in automatic mode and it allows you to load pages 2-3 times faster by optimizing the size of images. It should be mentioned that the search engines too have the requirements of fast page loading and provide a fast sites with a priority of the results. A plugin for compressing images in PHP works easily on most of hostings. Besides It does not require serious computing power and takes a minimal amount of RAM. It therefore does not affect the operation of the site, which remains accessible to visitors. To start the compression of images of the site in PHP, simply download the OptiPic plugin the official website, unpack it on your computer or right on the server and make necessary settings. All operations take no more than two minutes of site administrator’s free time. Image compression in PHP works both on available files on the server, and on downloaded ones. OptiPic regularly scans files to to find the images that have not yet been optimized. The practice has proved that the plugin for image optimizing in PHP provides an average of 70% reduction of image size. In some cases there was a more than 90% decrease in size. We can say that optimizing images of PHP-websites allows reducing the occupied space on hard disk. This cuts expenses and saves money that otherwise would have been spent on buying new disk quotas. Will image optimizing in be helpful for your project? The answer, most likely, sounds like "Yes it will". OptiPic works with the most popular web formats — JPG and PNG. A "smart" algorithm is capable of coping with any number of images and it is only a matter of time. OptiPic is a great help to the site administrators who should customize it only once and then watch the speeding up of page loading. How can optimizing images for PHP speed up a site? 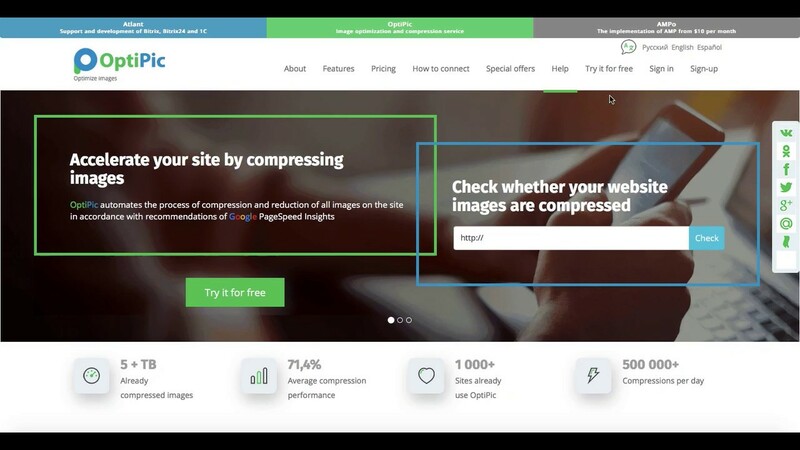 How to get started with OptiPic service for PHP for image compression?